Created by NSW Premier Mike Baird as a non-political initiative, Project Uplift connects disadvantaged youths with influential business leaders. 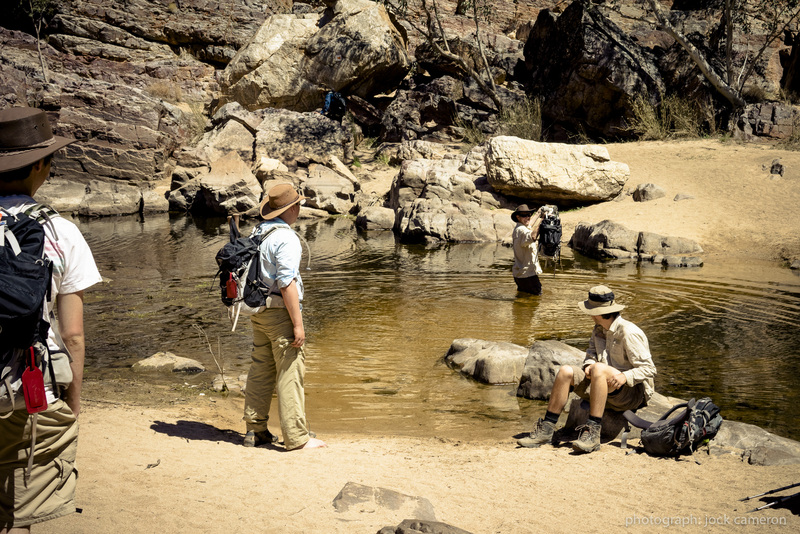 In this unique mentoring program, which took place over a 100-kilometre trek along the Northern Territory’s Larapinta Trail, eight high-profile men and women and eight young Australians shared a very different course all together. Thread Publishing talks to Premier Mike Baird about the story behind the project and its commitment for the future. The issues and challenges we all face on a day-to-day basis can be so overwhelming when we’re sitting in an office, surrounded by chaos and competing priorities. We are constantly plunging through doors, through meetings and interacting with people, that you can easily lose perspective on what is really important. A former politician said something to me when I got into office, which I’ve since taken on board. He said, “Make sure that while you’re in government – because governments come and go quickly – that you do something that’s from your heart. “There are the usual things that you have to do, when you’re in a position like this. But you have an opportunity here,” he said. “You have the opportunity to do something that really matters to you – to set up programs or events that mean something. With this in mind, I’ve always known that part of my role as Premier of New South Wales is to educate myself on the types of services available to support disadvantaged youths. Just as importantly, I knew I wanted to support these services in a hands-on way, to promote the work they do and give them a vehicle to talk more broadly in the media and through other platforms that may help to attract further support. During the process of learning more about these incredible services, my heart was frankly caught – and remains so. Hearing some of their stories and watching the incredible things that people are doing for these kids; it’s very moving and inspiring. So, I knew I wanted to help out in a sustainable way, and build something that could make a real and lasting difference. This goes beyond my role as Premier. I hope the next Premier can continue this program, regardless of their political party. But of course, it’s one thing to want to help, but it’s another thing to bring this desire to life. Before Project Uplift came into focus, questions preceded it. Such as, ‘What will the project be? What will it look like?’ So, over a period of three or four days, I liaised with my team and we workshopped ideas together. We would come up with an idea, then change the idea, and change the idea again until it felt right. Eventually we came up with something that stuck: Project Uplift. And it was perfect. The power of this program is that it puts influential leaders in the rare and trusted position to hear the stories of young kids who have been dealt a difficult hand in life; a hand that is completely and utterly unfair. They’re dealing with the ultimate sort of challenges – trauma and isolation – while trying to forge their way ahead in life. As mentors, we certainly learned as much from them as they did from us – if not more, I’m sure. I was humbled to share this first Project Uplift experience with some truly incredible mentors and youths. One such person was Gail Kelly, CEO of Westpac*. Ever since Gail committed to the journey, I’ve often been asked, “Why on earth would a CEO of one of the largest, most influential companies in Australia take a week off her schedule to spend time trekking with some disadvantaged kids and go all over the country?” But there was never any question in her mind as to whether she wanted to be a mentor. She gladly made the time in her diary, even though that decision involved some sacrifice. At the time of the trek, Gail was scheduled to speak at a global McKinsey conference. A lot of influential people and shareholders from around the world were due to be there, but Gail was fully committed and caught up in the passion of what we were doing to help Australian youths. I’ve come to realise that we don’t often open the door and have a look beyond our own lives. I’ve been honoured to hear the stories of others and I know that we have to do more for these kids. Originally, Project Uplift was scheduled as a bi-annual trip as it is quite a logistical exercise, but we’ve decided to do it every year, which is fantastic. Project Uplift has nothing to do with me or with politics, and I’d like it to stay apolitical. After all, politics is short and I might not be around in two years. This is a long-term commitment to make a difference in kids’ lives. I’d like to hand over the baton to the next person to continue the work, when the time comes. The mentors on the inaugural Project Uplift trip are: Premier Mike Baird; former Premier Nathan Rees; Westpac CEO, Gail Kelly; Pickles Auctions founder, Tim Pickles; Director Elizabeth Ann McGregor OBE from the Museum of Contemporary Art; seven-times World Champion surfer Layne Beachley; INXS rock star Kirk Pengilly; and National Student Leadership Forum founder and author, Jock Cameron. Premier Mike Baird worked with Oasis Youth Support Network, Youth Off the Streets, Southern Youth Family Services and Brookvale Youth Reach to choose the eight young people who would take part in Project Uplift’s first year’s trek. Completing the 100km walk would not only meaningfully connect these mentors and youths, creating opportunities for a better future, it reminds everyone that they have the strength to realise their full potential. * Gail Kelly will step down as CEO of Westpac on 1 February 2015.